That’s not Yvonne Craig. Just a stunningly accurate sculpture. I can write. You may not necessarily agree but I can at least stitch a few sentences together to make a point. But what I can’t do is draw, paint, sculpt or sew, save the occasional button or loose stitch. So, I’m really impressed by those who can take their passion and translate it visually, whether it be on page, screen or pedestal. 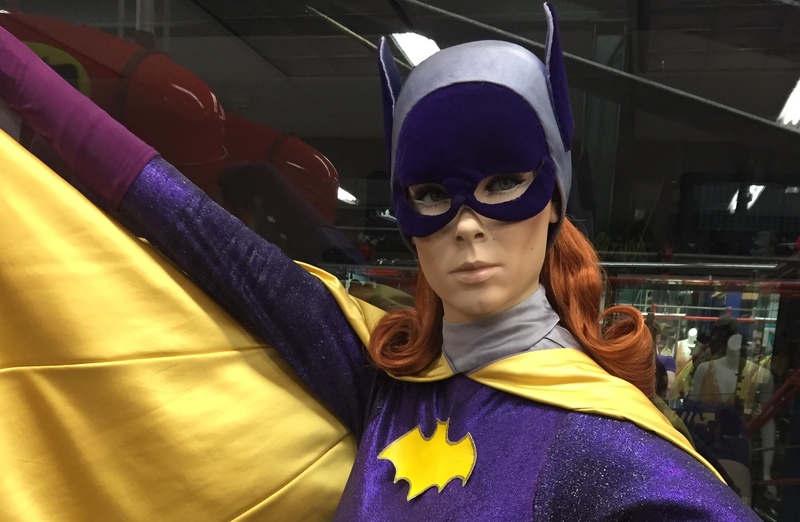 Through years of chronicling the legacy of Batman ’66 – celebrating its anniversary Jan. 12 – I’ve had a number of rewarding encounters with artists and artisans who’ve paid tribute to this beloved show through their considerable talents. Take Greg Maraio and his crew of fellow sculptors and designers – Marc Spess, David Costa and Daniele Tirinnanzi – who have been producing life-size mannequins of the show’s stars for clients like the anonymous man who owns the so-called “Alfred Collection” of original costumes and props (click here for much more on that) and 2018’s Batman ’66 museum exhibit in Hollywood (click here). The four have different roles, but in essence, Maraio is the Batman ’66 superfan of the bunch and the ringleader. His forte is costuming. Spess sculpts and molds the actors’ faces, Costa handles the paint jobs and Tirinnanzi produces the eyes. 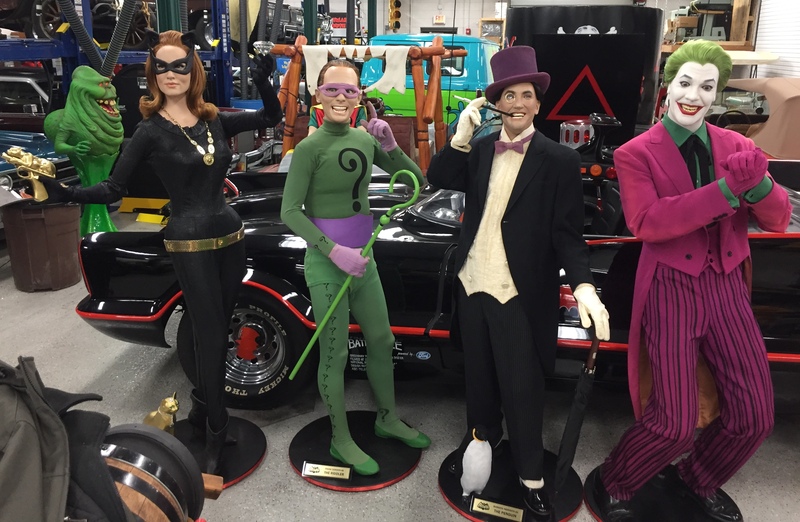 Like their well-known colleague in Bat-artistry Chuck Williams (profiled here in a past BATMAN ’66 WEEK), they use the latest technology to produce life-size, three dimensional tributes to a show that debuted 53 years ago. Dan Greenfield: What’s your background with Batman ’66? How did you discover the show? Greg Maraio: I was a child in the ’80s during a sad time when they weren’t yet airing reruns of the original series so my first introduction to the ’66 Batman was through the film. 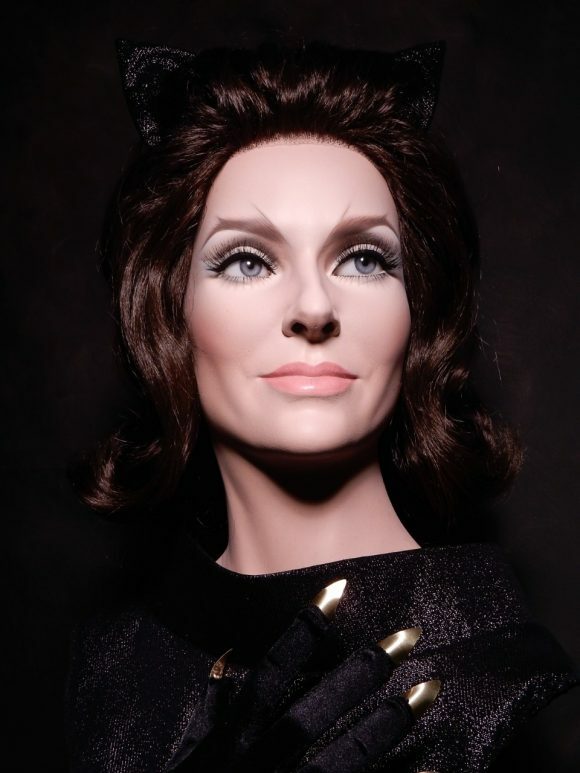 I became enamored with Lee Meriwether’s Catwoman. I, like many others, was also drawn to the fantastic costumes and design of the show. The colors, the action, the camp! It was much later that I was introduced to the series when it started airing again and I was just as fascinated as I was with the movie. The Catwoman costume was the very first costume I ever attempted to make! David Costa: I was born in 1961, so I was always familiar with the show and throughout my childhood I watched the reruns. Dan: Name all the actors whose likenesses you’ve produced. Greg: So far in the Batman universe we have created Burt Ward, Julie Newmar, Lee Meriwether, Frank Gorshin, Cesar Romero, Burgess Meredith and Eartha Kitt. We hope to do more characters in the future (Vincent Price, Otto Preminger). Dan: Are you an artist by trade? Tell us about your work. Greg: I went to the Art Institute of Boston, where I majored in illustration. 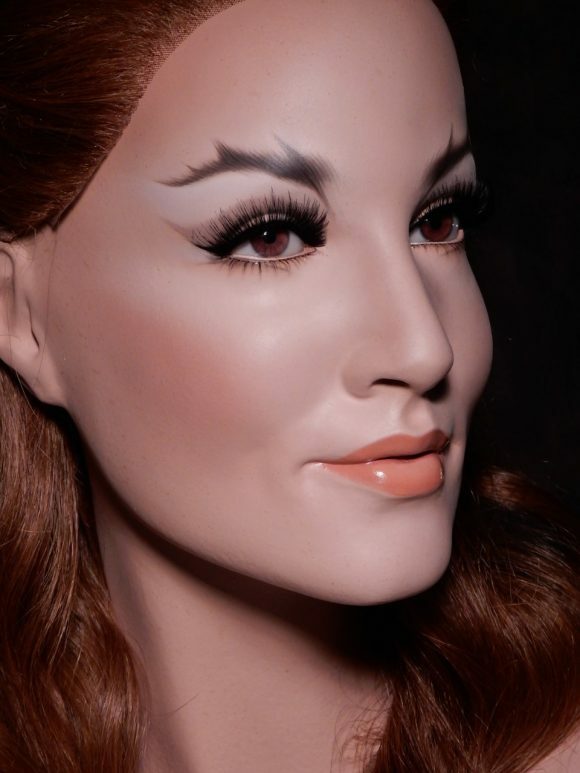 After college, I transitioned into costume design and replication, and now I am moving into the area of life-size costume displays with replica costumes and, in some fantastic cases, the displays for the original screen-worn costumes. Marc Spess: My main ability is to sculpt using the program ZBrush as well as in a traditional way using many different types of clays. I’ve worked on a lot of portrait sculptures in the past five years for various collectors. One well-known display New Yorkers may have come across with my work is the Gary Garabedian Christmas display. I’ve had to sculpt many celebrities and cartoon characters for him. I’ve also done a lot of private commissions for people who just appreciate sculpture and like to display it in their homes. David: Yes, I am an artist by trade. 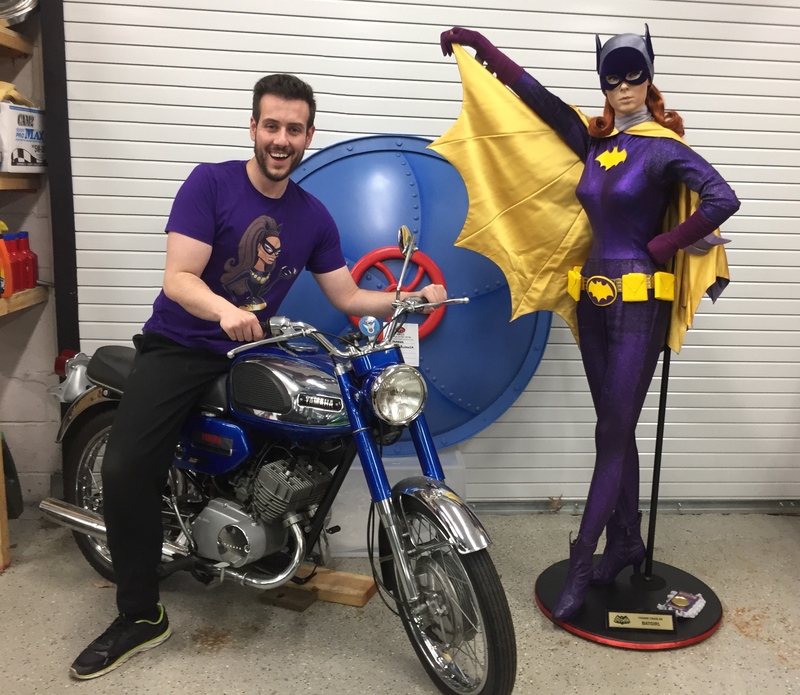 I’m actually a face painter of display mannequins for stores, but other collectors have found out about me and use me for other types of life size figures such as the Batman characters. I’m really known for my glamour work but will take on other types of face painting if it’s interesting or a challenge. I stay away from projects that involve monsters, blood, gore, etc. I’m not interested in working on things like that. Dan: Give us the basic rundown of how you’re able to capture an actor’s likeness. Greg: I handle the pose of the character and the hair and costume. Generally, we like to aim for a classic pose that captures the essence of the character, like the clasped hands on the Joker, or the finger point on the Riddler. It really makes the displays come together when the pose and the expression are all working together. Usually to achieve the perfect pose, the final display is a Frankenstein’s monster of many different parts. 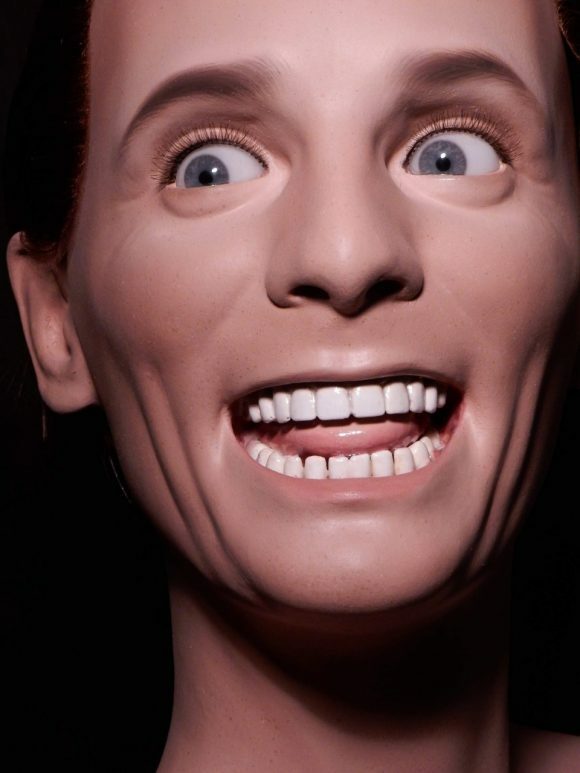 For example, the Joker has two different mannequins for the torso and legs, with a set of bendable arms, and also some articulated wooden hands. Marc: On the Batman ’66 project, Greg asked me to create the various actors and actresses. We carefully worked out which expressions they should have. So, for example the Joker had an iconic photo where his mouth is opened and he has a maniacal laugh. He and I would scour the internet for reference material showing all angles of Cesar Romero’s face to get the best possible likeness. Some photos had sharp lighting, which revealed certain details like wrinkles and moles, where others showed the general forms. Each photo usually had its own unique angle that allowed me to get the shapes to be very close to the real actors without being able to directly make measurements. 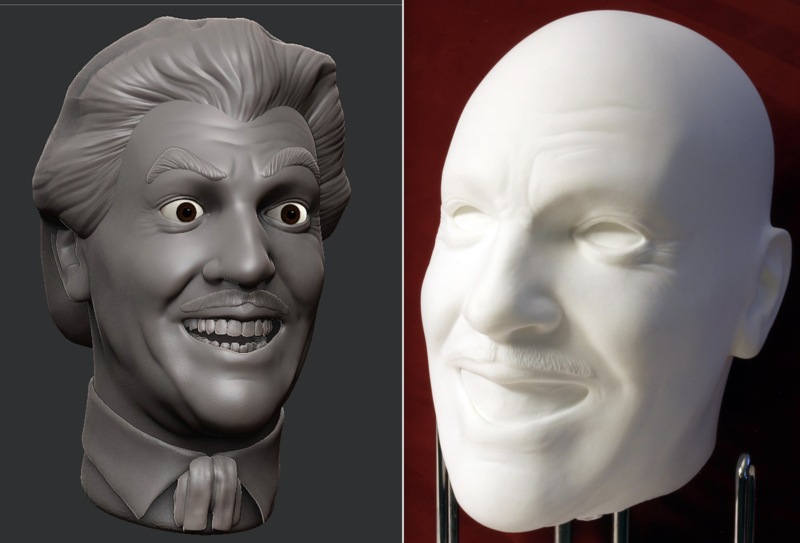 After the digital sculpt was completed, Greg would have the faces 3-D printed and I would then clean them up for molding and casting. David takes the castings and inserts special eyes, attaches the heads to a mannequin body of the correct proportions to the original actors and skillfully paints them. We had to work closely together by discussing the photo references of each face. Sometimes I would have a picture of the face we were working on that showed a particular flesh tone he could match. The Joker, for example, had white paint covering his entire head. However upon close inspection, we noticed that there was a particular pinkish hue you could see. David tried his best to get the colors as perfect as he could based on some rarer high-quality pictures we found. David and I also would communicate how the teeth would line up inside the face by sending photos of the alignment in ZBrush. If the alignment was off just a quarter of an inch, everything would look wrong. David has a great eye for those things and his paint jobs speak for themselves. They really brought the sculptures to life. David: I’m sometimes given reference pictures and go over the details so there is a clear understanding of how a client is expecting it to look finished. If I have any concerns about the sculpt itself, I’ll contact Marc just to be sure of certain things before I begin. Not only do I have to please the client but I also take into consideration what the sculptor’s vision is. Since I’m the last one on the totem pole and do the final painting and finishing, I have to make sure I don’t disappoint anyone. Dan: Are these for sale? If so, what do they run? Greg: Hopefully soon, but full custom displays that pass through four artists are not inexpensive. I guesstimate it is over 50 hours or work to produce a full display. Dan: What kind of feedback have you gotten from actors or their estates? 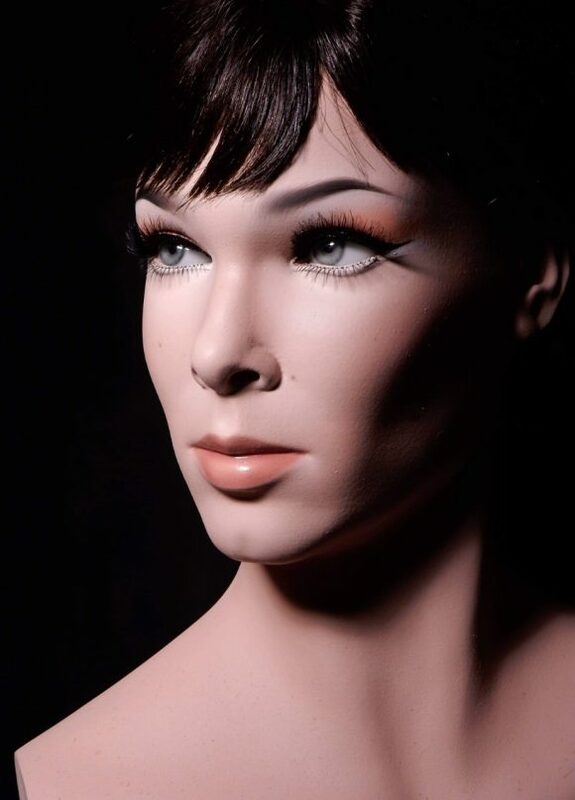 Greg: Yvonne Craig’s sister loves the Yvonne we did and was very moved by it. She was able to see the one on display at the Hollywood Museum. I presented Lee (Meriwether) with a bust. It was a surprise. Her daughters were involved in the process and they love it! — SNEAK PEEK: The Greatest BATMAN ’66 Collection You’ll Ever See. Click here. — Chuck Williams: The Crusader of Cowls. Click here. It’s so nice that these guys respect the legacy of the show. It’s so nice to hear from you, Meridel! Thanks for stopping by!